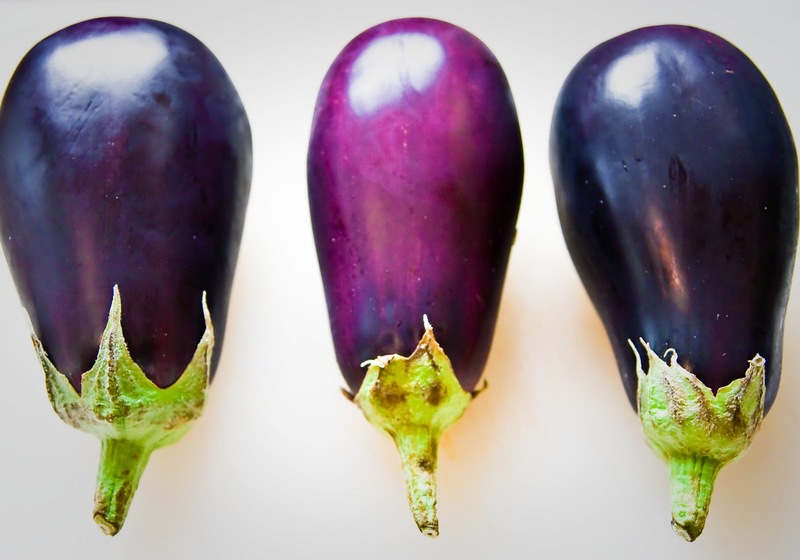 Veni, Vidi, Blogi: I Came, I Saw, I Blogged: Ode To The Eggplant. I don't know about where you are, but here in Western NY our farmers markets and grocery stores are simply overflowing with beautiful, ripe and purply eggplants. I have to admit, I have a love/not-love-so-much (hate is such a strong word) relationship with the alluring aubergine. Every so often, my vegetarian sensibilities will speak to me, saying, "Hey, you boring celery cruncher! It's time to expand your palate! Go flambé a fennel! Roast a rutabaga! Refresh a radicchio! And then I go make some mashed potatoes and call it a day. Every now and then I will get this unscratchable itch to Just. Branch. Out. And it usually happens during eggplant season. I don't know what it is. There is jut something so delightfully appetizing about seeing heaps of perfectly shaped purple eggplants piled high on a table. Maybe it's because purple is THE color of the season, and it just makes me feel so stylish to be standing next to a table of violet-colored lovelies. In my cheese-cracker-encrusted shirt and unwashed hair. Oh, so stylish, indeed. Whatever it is, I am powerless to purple's charm. Eggplants to Mahreen are not unlike a flighty friend - she always lures me in, whispering the promises of friendship bracelets and matching jelly shoes. And then just when she's got me handing over my super-limited edition Cabbage Patch Kid she always dumps me for an impromptu game of kissing tag behind the playground where we are NOT supposed to ever hang out. Ahem. That never happened to me. Yousuf: You picked an eggplant. Me: I know. It wasn't a mistake! Yousuf: But we don't even like eggplants. Me: But how do you KNOW that we don't like them? Yousuf: Because whenever we make them we say we're never going to do that again. Me: Are you saying that I can't cook? Because I totally CAN. Yousuf: I didn't say that. Just that we can't cook eggplants. Me: But just look at them sitting there...all lined up in a row...they're so PRETTY! And they're calling to me. They're saying "Come and buy me! I'm gorgeous and PURPLE and just the right shade to set off your gorgeous olive skin tones on days that you have showered! You NEED me to be complete!" Yousuf. Dude. It's a vegetable. Not an accessory. At which point I buy a whole bag full of eggplants and they sit around in my kitchen while I admire their beauty for a few days. I make cooing noises at them and pet them whenever I think I'm not being watched. Yousuf thinks I've officially gone around the bend (what else is new, right?). And then things REALLY start going south. 1) I am nuts for admiring my aubergines and instead of eating them I have let them go from purple to putrid. 2) I can't cook under stress. And the stress of turning disgusting eggplants into delectable eats is too much for any sane person to bear. 3) Just in case you were not aware, I am anything but sane. And that is basically why, up until now, I could have eggplants in my house for decorative purposes only. You might think that's crazy but I can assure you, I'm not the only one. This past weekend I was at an arts festival, helping to man my friend Carla's booth and of course to people watch too. Carla's table was definitely the place to be - there were all kinds of interesting folks that stopped by and talked with us, and one in particular totally made my day. A gorgeous young woman came up to the booth and said how Carla's work was so inspiring, and how she hoped to make something similar for herself. Carla was flattered and said that her inspiration came from all around her - and the woman agreed wholeheartedly. She went on to say how her biggest inspiration at the moment came from the natural world, from plants and trees and food like.........wait for it..........EGGPLANTS. And then Carla said that she had no idea what to do with eggplants in terms of eating them, but she sure as heck had the urge to shelac them and mount them to her wall. I swear I could have kissed them both right then and there. Take THAT, dear husband of mine - neener neener neener! Three little eggplants, all in a row. Getting ready for a good shellacking. Yousuf is going to be SO impressed with me. Sadly, I didn't ever get to mount my picture-perfect eggplants to anything - because I FINALLY found a great recipe that actually tastes INCREDIBLE and it's totally easy to make and the people in my house are clamoring for eggplants all the time now because of it. We call it Yom Kippur Eggplants. What? You didn't know that eggplants were a traditional Jewish dish? Well they aren't. And I'm not even Jewish. But stay tuned tomorrow for that post - and recipe. I promise the wait will be worth it. I know, I know. I'm totally bonkers. And I can't believe I just wrote an entire post about a vegetable.